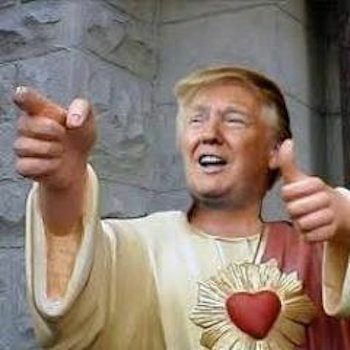 Trump the False Messiah: Will he become the workers' anti-Christ? American workers have been sold a pup, says John Passant. As the Great Recession morphs into the Long Depression, their false messiah will throw them under the bus. WORKING CLASS voters in the American mid-West (or rust belt) states, which globalisation and neoliberalism have destroyed, have delivered the Presidency of the United States to Donald Trump. Trump’s rhetoric and his protectionist and isolationist polices appealed to them. Some also identified with his othering of Muslims, Mexicans, women and blacks, to name a few, or held their nose and voted for him because he expressed their anger with the elite and their poor pay, lack of jobs, poor housing, unemployed and other basic working class problems. The contradiction for Trump is that he will be managing the very economic forces that demand he attack workers’ pay, jobs and conditions to restore U.S. profit rates. He is well placed to do this. Trump has spent his whole life screwing his own workers and small businesses who deal with him. Protectionist policies like a 45% tariff on imports from China and Japan and 35% from Mexico will impose costs on workers in the U.S. through higher prices and will, almost certainly, provoke retaliatory action from those countries. That will do nothing to address the growing inequality in the U.S. over the last 20 years. It will make it worse as the burden of increased costs will hit the low paid more than the high paid. Building a wall with Mexico will cost $25 billion and may well cut off a flow of cheap labour for small businesses across the country, including those border states that voted for Trump. It will undermine the viability of those businesses to greater or lesser extent, as will deporting 11 million undocumented immigrants from the United States. The U.S. spends over $600 billion a year on its military — about 54% of discretionary budget expenditure. There is no indication he will cut this and indeed his rhetoric about making America great again and destroying the enemies of America indicate he might spend more on the military and, as a consequence, less on social welfare. On top of that, workers will pay for a cut in US company tax from its current 35% to 15% through cuts to government spending on various social spending on for example schools, health and transport. Repealing Obamacare will send millions more into poverty when they get sick. Donald Trump in 2016 is not Ronald Reagan in 1980 or 1984. The basics of the economy are much worse now than then. The Great Recession from the global financial crisis in 2007/08 is in danger of becoming, if not already morphing into, the Long Depression. Trump’s first task will be to implement policies that continue and accelerate the shift in wealth from labour to capital and this means more anti-worker policies that the ruling class think will deliver on this. This means more inequality and, perhaps, not just stagnating wages but cuts to real wages and/or increasing unemployment. That a billionaire who screws his own workers is now the hero of many workers tells us much about the political backwardness of the American working class and the lack of a serious left. Even Bernie Sanders, the self-professed democratic socialist who did burn bright during the primaries, in the end turned his "revolution" into a siphon for Clinton, the candidate of the political and economic establishment. Some of those workers who voted for Obama and however rhetorical his words – "hope" – crossed over to Trump. Many of those workers who did not vote last time voted for Trump. They may have voted for Sanders if he were a candidate, although we will never know since the establishment destroyed his run. Union leaders supported Clinton. Members of unions in industries affected by globalisation and neoliberalisation often voted for Trump. Poor people voted for the billionaire. The Democrats, one of the two political wings of the ruling class, in choosing Clinton offered a politician of the status quo, a person at the heart of neoliberal policies that have destroyed jobs in the rust belt and other states. Without a strong and committed left, prepared to really fight the ruling class and able to mobilise millions, the shift to a supposed "outsider" like Trump should come as no surprise. The illusions in Trump cannot last long. He must attack his supporter base to restore profits for the ruling class and in response to the looming worsening of the economy. The President-elect says he will bring jobs back to America. Let’s leave aside the fact he sells products made in China. Trump is no King Canute. He actually thinks he can turn back the tide of globalisation. If he tries, the interconnectedness of the U.S. and Chinese economies – U.S. exports to China were $161.6 billion and imports from China were $497.8 billion – could destroy both. Given China has over a trillion dollars invested in U.S. Treasury bonds, any major disinvestment by China, whether in retaliation for U.S. economic or military aggressiveness or as a risk management measure, could undermine the U.S. economy and the Chinese economy too. Trump’s environmental policies are non-existent, other than dismantle the Paris Agreement on climate change. Trump has at various times claimed climate change is a Chinese hoax and then denied he ever said that. Profit comes first, first, and first, and the environment a long last. Trump’s policies of protectionism and America first threaten world trade and could deepen and extend the Long Recession around the globe. China is on the way with ups and downs to surpassing the U.S. economy as the biggest in the world. Trump’s election reflects the yearning for the good old days when the U.S. was dominant economically, militarily and politically. Trump cannot reinvent a unipolar world in a bipolar one. King Canute understood; President-elect Trump does not. Trump’s "nuke the baddies" approach to military affairs threatens to upset the balance of uneasy power. U.S. imperialism may challenge Chinese imperialism in the South China Sea. Trump’s isolationism and his rhetoric about making America great again around the globe are contradictory. He could withdraw or blunder in. We don’t know yet. Australia has a close relationship with U.S. imperialism and has had since World War II, when the U.S. replaced the UK as the major global imperialist power. Now is the time for the Turnbull Government and the Labor Opposition to rip up the ANZUS Treaty. The Alliance traps Australia into supporting and being part of a vicious war machine which spreads death and destruction around the globe. We could use the money saved for social purposes like health, education, transport and renewable energy. What can we do? Organise, don’t agonise. Here in Australia, we need to build all the small mass movements – for refugees, for Aboriginal people, for equal love, against war, against racism and Islamophobia, for example – into bigger movements and orient our focus to include workers struggling here for better wages, in defence of jobs and for safety on site, as examples. One Nation is our embryonic Donald Trump. It is no good waiting for the Labor Party and Greens to mobilise us against Australian Trumpism. A lesson they could draw from Trump’s election is that they need to move to the left to win a mass base of workers to their side. They won’t because the focus of those parties is on gasbagging in Parliament. A lesson the union movement could learn is they need to radicalise and win workers to defending their immediate economic interests through industrial action rather than leaving workers exposed to falling for the lie that One Nation will do that. Leftists should focus on building the fight back against the neoliberalism of whoever is in government, the social reaction currently in charge and the attacks of the bosses on our living standards and jobs. Occupy the streets! Reclaim our workplaces and our unions. That way we can defend ourselves and by doing that send support to the social movements in the U.S., such as the $15 an hour wage campaign, the struggle at Standing Rock against the Dakota access pipeline, Black Lives Matter, indeed, all those in the U.S. who are fighting the status quo of the Republicans and Democrats. Stephen Colbert in shock as he tries to make sense of the election. @jenheger Trump supporters appear to be very naive. They must know he only uses overseas factories. Temp & foreign workers in hotels? Support independent media. Subscribe to IA for just $5 a month.